This gorgeous imagery is like a diamond in the rough! The breathtaking imagery of this staple-bound calendar intensifies the accompanying inspirational messages. Beautiful 13-month calendar clearly identifies holidays and other special remembrances. Each page displays the current month along with at-a-glance calendars of the preceding and following months. Constructed from durable 60#, UV-coated gloss paper stock. Size, open: 19" x 10-7/8". 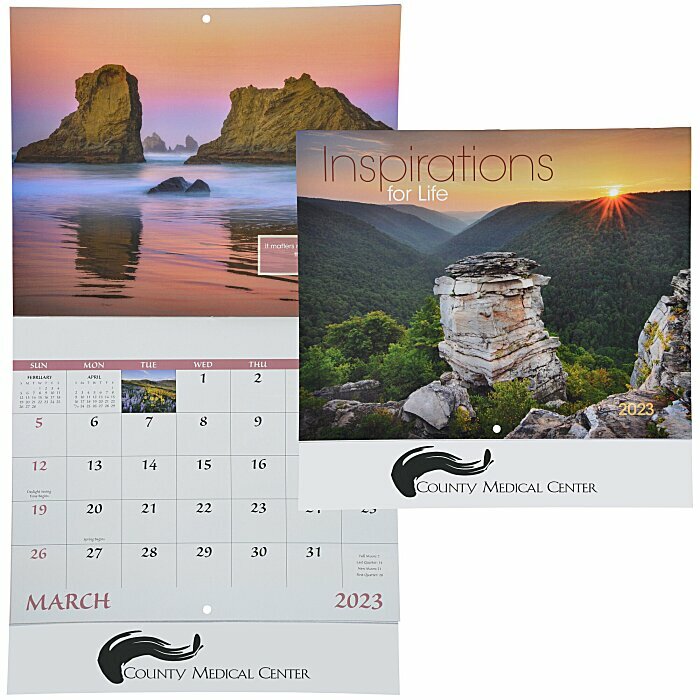 For spiral-bound calendar, see item #111993-SPInspirations for Life Calendar - Spiral; for the calendar with imprinted window, see item #111993-WDInspirations for Life Calendar - Window. Envelopes available for an additional charge; please indicate the quantity desired in the additional comments section during the ordering process. Your price includes a one color imprint on the bottom of the calendar.